Immigrant Parents Search for Children Snatched by Gov’t at the Border, But Reunification Is Rare | Democracy Now! independent journalist based in Brownsville, Texas, on the Mexico border. senior researcher at Human Rights Watch. AMY GOODMAN: We begin today’s show with an update on the more than 2,300 children separated from their families at the U.S.-Mexico border after their parents were charged with illegal entry under the Trump administration’s ongoing “zero tolerance” policy. The U.S. military is preparing to house up to 20,000 immigrant children on military bases in Texas and Arkansas. A Pentagon spokesperson said the bases would house, quote, “unaccompanied alien children.” But other reports suggest the bases might be used to indefinitely hold entire families, following President Trump’s executive order ending the separation of children from their parents at the border. On Thursday, a senior Trump administration official told the Associated Press that 500 children have been reunited with their family within days of being separated. He was an unnamed official. Meanwhile, other parents say they still don’t know where their children are. Trump spoke to reporters about family reunification on Thursday. PRESIDENT DONALD TRUMP: I signed a very good executive order yesterday, but that’s only limited. No matter how you cut it, it leads to separation, ultimately. I’m directing HHS, DHS and DOJ to work together to keep illegal immigrant families together during the immigration process and to reunite these previously separated groups. AMY GOODMAN: On Thursday, first lady Melania Trump made an unannounced trip to a detention center for immigrant children in Texas. As she left Washington and came back, she was wearing a jacket that read, scrawled across the back of the jacket, “I really don’t care, do u?” She spoke to reporters after her visit. MELANIA TRUMP: Let me begin to recognize each of you and thanking you for all what you do, for your heroic work that you do every day and what you do for those children. We all know they are having—they’re here without their families. And I also like to ask you how I can help to these children to reunite with their families as quickly as possible. AMY GOODMAN: When she asked how the children were doing, one of the workers at the facility said that they are traumatized. Meanwhile, mayors of about 20 U.S. cities gathered at a holding facility for immigrant children in the border city of El Paso and accused Trump of failing to address the crisis. Back in Washington, a hard-right immigration bill failed to pass the House, and Republican leaders delayed a planned vote on a compromise bill that would offer DREAMers a pathway to citizenship and includes $25 billion for Trump’s border wall. 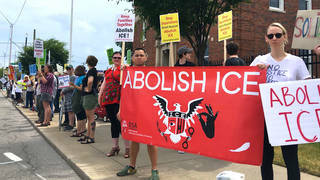 Around the country, protests continued against Trump’s “zero tolerance” policy. In New York, dozens of parents and babies took over the offices of the field office of director for ICE Enforcement and Removal Operations. Children sang together and drew on paper hearts to leave behind in support of the more than 2,300 children taken from their parents. This is one of the kids, speaking through tears. CHILD: The children that are being kept in cages have no clue what is going on. The least you could do is tell the parents that they will see their kids. They are probably wasting away in worry. They love their kids, and they want to know it will be OK. We were a safe haven to those in need. But we are no more. I hope that you will be here, take peaceful action, and love the least of these. AMY GOODMAN: Also here in New York, an immigrant mother from Guatemala who fears deportation went into physical sanctuary in a church in New York City on Thursday. Debora Berenice Vasquez said she was told to leave the country in May during a routine check-in with federal officials at ICE, and fears separation from her 10-year old son Kenner, a U.S. citizen. DEBORA BERENICE VASQUEZ: I understand now what the mothers are feeling that are being separated from their children. And it’s important that we remember that this is not only happening on the border, but it is also happening in New York and in cities and states across the country. AMY GOODMAN: As concerns grow about poor coordination between Customs and Border Patrol, which takes the children, and the Office of Refugee Resettlement, which puts them into shelters and foster care, The Intercept has a new report on one of the first reunifications. Reporter Debbie Nathan spoke to a Guatemalan woman whose 5-year-old son was taken from her last month by immigration authorities in Texas after she sought asylum. She has been reunited with him after 38 days in detention. This is a clip from The Intercept's video, when we hear the mother, Delia, who uses a pseudonym, describe what happened. We'll hear that clip after this break. AMY GOODMAN: “Hush, Hush, My Baby,” by Carmen Canela. This is Democracy Now! I’m Amy Goodman. As concerns grow about poor coordination between Customs and Border Patrol, which takes the children, and the Office of Refugee Resettlement, which puts them into shelters and foster care, The Intercept has a new report on one of the first reunifications. Reporter Debbie Nathan spoke to a Guatemalan woman whose 5-year-old son was taken from her last month by immigration authorities in Texas after she sought asylum. She has been reunited with him after 38 days in detention. This is a clip from The Intercept’s video, when we hear the mother, Delia, who uses a pseudonym, describing what happened. DELIA: [translated] They tricked me. They told me we should go to the bus, that we were leaving. I was happy I was going to be with my son. When I sat down on the bus, my boy and I were both crying. Then they said, “Ma’am, get off.” I thought I was going to get out on Monday or Tuesday, but then they said, “Clean your bed because you’re going today, right now.” I was so excited. I was jumping up and down with happiness. And all my compañeras, when I left, clapped with happiness that I was going to see my son, because they saw how, night and day, I’d been crying, wanting to be with my son. Oh, I’m so happy because I have my son. Debbie, welcome back to Democracy Now! DEBBIE NATHAN: Hi. Good morning. AMY GOODMAN: Can you describe just that? How did, well, the woman who’s going by the name Delia get her little boy back? DEBBIE NATHAN: Well, it just took an incredible amount of resources, and it was really happenstance. What happened was, I had located this woman and started investigating her case back in early May. And then, as I continued the reporting, I contacted organizations and lawyers to get more information about how the process worked or doesn’t work. And in the course of that reporting, a lawyer said that she would go visit Delia in detention. And she went and did that and decided to take her case. So, now she had a pro bono lawyer, which is something that most people in this situation don’t have at this point. And this lawyer is a very good immigration lawyer and guided or prepared Delia to do a credible fear hearing, which she had, and it was very successful, and she passed her credible fear test. So then the lawyer went to all kinds of—you know, worked really hard to arrange with the agency that had managed the case of the little boy, who probably had him in foster care. I’m not quite sure where he was. But so, she did paperwork, and as soon as Delia got out of detention, she and her husband—the lawyer and her husband—drove her down to get her little boy. So, it was a lot of work that took place outside of the government system, of whatever the government says it’s going to be doing or has done. This all took place outside, and it was a really wonderful thing, but it was very exceptional. AMY GOODMAN: Talk about that. How exceptional is it? The government has just floated, through an unnamed official, that 500 parents have been reunited with their children. You would think, if that were the case, that they would not put this through an unnamed official. Usually, you do that when you don’t want to trace back a lie to someone. What is your sense, in Brownsville, of what’s happening? DEBBIE NATHAN: Well, you know, I haven’t heard about people being reunited en masse. In fact, the lawyers and sort of this loose coalition of people in Texas that have been trying to find these people and go in and interview them in detention centers and try to give them representation, the case that I reported on is the first one that they know of where somebody was actually reunited. So I’m not really sure what that means. It’s certainly not something that we hear about in Brownsville, which is the thick of the situation. Most people who have been separated have been in this area. AMY GOODMAN: I want to talk about the director of the Office of Refugee Resettlement, Scott Lloyd. ORR, the Office of Refugee Resettlement, is the agency tasked with caring for the thousands of children who have been forcefully taken—forcibly taken from their parents. According to a Politico article headlined “Meet the anti-abortion Trump appointee taking care of separated kids,” they write, “Prior to assuming leadership at ORR, Lloyd cofounded the WitnessWorks Foundation for a Culture of Life—an organization dedicated to Catholic teachings and 'guided by the principles of our faith'—and worked for years in its legal arm. At the Knights of Columbus, he described himself on his resume as the 'architect of late-term abortion restrictions' passed by six states, while writing articles about banning 'dismemberment abortion'”—as he put it—”and 'Big Abortion's evolving profit structure,'” he said. “Lloyd also served in the George W. Bush administration as an attorney at HHS,”—Health and Human Services—”co-writing the 2008 conscience rule allowing medical providers to refuse contraceptives, abortions and other care on moral grounds.” That's the piece in Politico describing the man who was in charge of what will happen to these thousands of children taken from their parents. It doesn’t sound like he has much experience with refugees, Debbie Nathan. AMY GOODMAN: But he personally went down to Texas to try to prevent an immigrant woman from getting an abortion. Is that right? DEBBIE NATHAN: Well, yes, but not only that, there are records where it’s clear that he’s intervened even without being in Texas. AMY GOODMAN: I also want to turn now to New York Congressmember Kathleen Rice. Now, apparently New York has something like 700 of these separated children. They have been flown up to New York. She appeared on Wolf Blitzer’s show on CNN. She was asked by Blitzer if she believed the children separated will eventually be reunited with their families. REP. KATHLEEN RICE: I don’t see how it could possibly happen. And to be frank, the administration has basically admitted that, that there is no way that they can reunify these children with their parents. They didn’t take any information at the time that they took them from them. A lot of these kids barely even know their own names, don’t speak English. So this reunification process is going to be next to impossible, it seems to me, which, you know, I hope people really understand that. There are 2,300 children who may never see their parents again, ever. And that’s on us, this country, the United States of America. AMY GOODMAN: That’s New York Congressmember Kathleen Rice. Debbie Nathan, can you respond? DEBBIE NATHAN: Yeah, well, I mean, I think, essentially, what’s happened is that there is going to be an outsourcing. It’s already happened. For example, RAICES, which is a group that’s been involved in advocating for unaccompanied minors, now, just suddenly, within a few days, collected almost $20 million, you know, just from the public, from people out there in the community all over the country and probably the world. And so, they and other groups and other—and lawyers, I think, have come together, you know, outside of the government, and they will be going in and trying to locate parents in detention, and they will be trying to do this work—exactly what Virginia Raymond, the lawyer who took Delia’s case, did. There are just hundreds of people that are getting ready to do this, that are already doing it. And I think that’s how much of this will happen. So, it will be sort of this privatized, outsourced reunification effort, going on already, very heroic. I don’t think that 2,300 children are never going to see their parents again. I think it will take a long time. It’s not systematic. But as I said, I don’t know—I don’t think the government is going to be the entity responsible for these reunifications, generally speaking. AMY GOODMAN: We’re also joined by Clara Long, senior researcher at Human Rights Watch. If you can weigh in here around the situation of these separated children? CLARA LONG: Yeah. I mean, the agency that’s doing these separations, Customs and Border Protection and Border Patrol, has a history of haphazard recording of the identity of especially tender-age children. So one of the huge challenges that I see coming up is that children have been separated, placed in these ORR facilities, who are not young [sic] enough to know their parents’ names or to know details of their parents, and that that information has not been recorded by officials. The other huge challenge, I think, that Debbie is pointing to and that is important to recognize, is that these adults are being held in immigration detention centers that have very low rates of legal representation, over 200 facilities around the country. Most people don’t have access to a lawyer. So, the idea—I mean, and it’s wonderful that people are supporting legal representation in immigration detention. That’s incredibly important, because we need thousands of Virginia Raymonds to go in and represent these parents and fight that fight. AMY GOODMAN: And you have President Trump now talking about—”We’re are not bringing in thousands of judges,” he said. CLARA LONG: Right, which totally—which, again, completely clogs up the system, keeps these parents stuck in limbo without a decision on their cases. If I may, Amy, one of the things that pops up again and is actually a huge stain on President Obama’s human rights record is long-term prolonged family detention, something we saw develop—I know that you guys covered—after 2014. In 2015, I remember I went into a family detention center and spoke with families who had been detained for a year or more. They said that they were feeling—had suicidal feelings, anxiety, depression. Family detention is very harmful. AMY GOODMAN: Now, can you explain this, though? AMY GOODMAN: —on whom this settlement is based. But it said that children cannot be held for more than 20 days. And that is what Trump is dealing with now. He wants this overturned so that he can continue to hold the children, maybe still—at least with their parents. But, in fact, you were going to centers, and our reporter, Democracy Now!’s Renée Feltz, was going to these centers, where families were held for over a year. CLARA LONG: Right, because the Obama administration didn’t want to comply with that legal settlement, either. And it took committed advocacy by plaintiff’s lawyers for the Flores children and many, many others to hold the Obama administration to that short-term 20-day limit. So, when the Obama administration reinstituted family detention, after eradicating it—they eradicated it in 2009, reinstituted it in 2014—they attempted to hold people indefinitely. AMY GOODMAN: Now, before we go to your big report on ICE detention and the terrible conditions when it comes to access to medical care and people dying in ICE detention, Clara, I wanted to go back to Debbie Nathan, because this woman who calls herself Delia came here because of domestic violence. We’ll talk about that in a moment, because it looks like we just lost Debbie.